The comparison to be made was for the tonal and touch qualities between harpsichord wire made by Malcolm Rose in the U.K. and that produced under the name of Voss and of Little Falls Alloys (Instrument Workshop) in the U.S.A. and of P-Wire, produced by Stephen Birkett at Wellington, Ontario, Canada, in addition to the differences produced by a lighter stringing schedule. 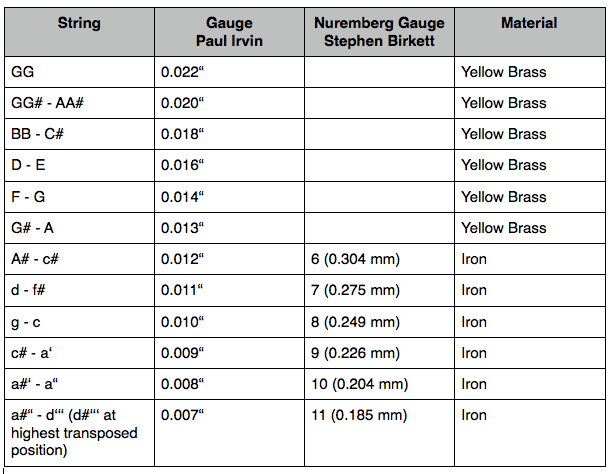 Three pieces of music were selected to be recorded first using Rose iron, yellow brass and red brass wire and then subsequently once more after the wire had been replaced by Voss iron and Little Falls Alloys (Instrument Workshop) yellow brass wire and had had at least two weeks to settle in and finally, three years later, with P-Wire zero carbon iron wire by Stephen Birkett at Waterloo, Ontario, while the brass remained the same Little Falls Alloys wire. The Rose wire had been installed into the instrument in 2001 and had never been replaced and was therefore nine years old at the time of recording. The Voss and Little Falls Alloys wire was new. In January 2014 the Voss iron wire was replaced by P-Wire while the brass wire was not replaced. The instrument used was a single manual harpsichord, designed by Emmanuel Danset at The Paris Workshop, roughly based on the Philippe Denis of 1674 and constructed, with adjustments, from the ‘‘le Junior‘‘ kit which was milled by the Paris Workshop in Paris, sold through Zuckermann Harpsichords in Connecticut, USA, and completed in 2001 in New York City by this author, the time of the installation of the Rose wire. The instrument design was adjusted to include a resonnateur after Tibaut de Tulouse beneath the nut and the soundboard is cross-ribbed. The bridge and nut are italiante and of walnut. The case is of American wild cherry, gessoed and oil painted in tromp-l’œil tortoiseshell. The GG – d”’ chromatic keyboard has grenadilla touchplates on the naturals, cherry sharps and is both front balanced and front weighted and is able to be transposed to three different pitches with a loss of GG in the lowest position. The lower braces were tuned using a spokeshave to a d minor triad at 392 Hz before the soundboard was installed. The soundboard ribs were likewise tuned to a d minor triad at 392 Hz after gluing to the soundboard. The instrument was voiced in European hooded crow quill (Corvus cornix) with registers set at a distance of 3.6 mm from the tongue front to the near edge of its respective string at the centre of the keyboard. The feathers used are moulted by local Berlin crows and collected during dog walks from parks. Quills are brought it a point of ca. 1.5 mm in the bass to 0.5 mm in the treble. Quills are harvested from the bass of the feather barrel to the distal tip of the feather from bass to treble of the instrumet. Eight feathers were used for each register. Feathers were stood in extra-virgin olive oil (as per Adlung’s suggestion) for ca. one month and then wiped clean before voicing was commenced. It was found that the quill (European hooded crow) needed to be regulated once the Voss wire was installed; the tips of the quills were narrowed from a previous average width of 2.0 – 1.5 mm to a width of 1.5 – 0.5 mm. The amount of quill protruding beyond the strings also required being shortened from an average protruding length of 2.0 – 1.5 mm to a length of 1.0 – 0.5 mm. (The registers were kept to allow an average of 3.6 mm between the front of the jack tongues and the strings nearest edge, as per Ruckers). This was desirable due to the lack of complex upper partials from the Voss wire. Likewise, the strength of the plectra was able to be reduced while maintaining approximately equal volume and tone due, in part, to the lower tension of the stringing schedule. It was also found that the quill grabbed the Voss wire slightly less than the Rose wire, resulting in a slightly more comfortable touch. P-Wire was found to have a silvery touch which was even smoother under the finger than with the Voss wire. Prior to restringing the instrument four cross-wise sound board ribs running under the 8‘ bridge which had become free from the sound board for approximately 4-5 cm at their tips, nearest the bentside, were glued back in place with rabbit hide glue (supplied by Marc Vogel) and parchment, and small blocks of beech were likewise glued to the liner (but not to the ribs) under their tips to ensure that they not become free again in the future. The sound board ribs had become free due to the instrument having been dropped in a New York church in 2007 by their flower arrangers. The three pieces of music selected were Louis Couperin‘s G minor Prélude, Jean Philippe Rameau‘s A minor Allemande (from the first suite) and Johann Sebastian Bach‘s Chromatic Fantasy (without fuge) and were performed on the front 8‘, back 8‘ and both 8‘ registers respectively. Historically appropriate pitches and temperaments were used in all cases. The temperament used for the Bach recordings is in accordance with my reading of the temperament described by Bach‘s pictograph on the front page of the WTC and conflicts with other musicologists‘ interpretations thereof. My article on Bach’s temperament can be read in full at https://www.academia.edu/3368760/Rosetta_Revisited_Bachs_Very_Ordinary_Temperament and on this website at “Rosetta_Revisited“. It should be stressed that the Rose wire used was of reasonable age (11 years), where the Voss, P-Wire and Little Falls Alloys wire was new. It should also be remembered that some small amount of repair work was carried out on the underside of the soundboard which was done more for reasons of stability than tone and likely did not effect the tone considerably if at all. All recordings were made using domestic equipment which included a Sony ECM-MS957 stereo microphone set to 120 degrees and a Sony MZ-N10 mini-disc recorder. The recorded soundfiles were uploaded to an iMac intel using Logic Pro X and were adjusted using a Sony ‘‘Professional‘‘ MDR-7506 headset. The instrument was recorded in a sparesely leather-furnished and uncarpetted domestic apartment with no curtains. All recordings were made under identical conditions including the placement of the microphone which was positioned 10“ above the middle of the bentside of the harpsichord and pointed horizontally and directly perpendicular to the spine. Idential pitches and temperaments were used in all cases for each category of recordings so far as is humanly possible. The instrument was recorded while at a standing height (80 cm from floor to bottom board) rather than a sitting height. All temperaments were tuned by ear and without electronic tuning devices. An electronic tuning device was used only to establish the pitch for the Rameau recordings at 409 Hz and was used only for the starting note of a‘. This was required due to the lack of an available tuning fork at that pitch. The initial intention of the Wire Project was to demonstrate the differences of wire for personal and private interest. However, the vast differences in tonal response to the second wire, Voss, made clear the noteworthiness of this comparison and highlighted a possible public interest. When The Wire Project was commenced P-Wire was not yet publicly available and had not been contoured into the project’s goals. Had the project been commenced with public dispersal in mind better recording equipment would have been procured and used, negating the need for post-production graphic equalisation. 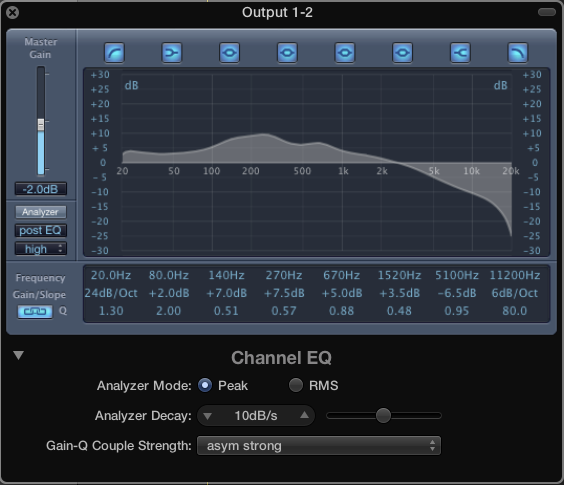 However, failing this, some graphic equalizing was required, due to the mediocre qualitiy of the recording equipment, to better approximate the actual sound of the instrument when compared with it live. All recordings were adjusted in an identical manner and in conjunction with the instrument live though side by side comparison. All apparant reverberation is the result exclusively of the use of historically shaped dampers which allow sympathetic resonance from registers not employed in the recordings. The cloth dampers were replaced with felt before the Bach was recorded with the Voss/Little Falls Alloys wire and damp more fully than in the first recording. It was felt that due to the lower string tension the somewhat larger oscillation of the bass strings was too great for the cloth dampers given the front weighting of the keyboard, this hampering repetition and disabling trilling. It should be remembered that the tone of an instrument on any recording can never be a fully accurate representation of the sound of that instrument live, these recordings however bear a reasonably close approximation. To fully appreciate these recordings it is suggested that good audio headphones are used rather than computer speakers. Please feel free to contact me personally with any questions or to leave comments at the bottom of this page. Recorded: 26.10.10. and 11.02.11 Berlin, Germany, respectively. Recorded: 10.11.10 and 23.01.11 Berlin, Germany, respectively. The appeggiated sections of the Fantasy are played according to the description of their execution as explained in the final chapter on improvisation (of fantasies) in C.P.E. Bach‘s ‘‘Die Wahre Art das Klavier zu Spielen‘‘ (1776). C.P.E. Bach‘s fingerings, as he wrote them into his copy of the Fantasy, have been used in the performing of this piece. Thank you for your study and for using one of our instrument. Thank you, Emmanuel Danset. Your comments have been noted and the above text altered to reflect the information you have supplied. Please do visit The Pin Project https://dominiceckersley.me/the-pin-project/ also. It’s a recently developed project involving the use of 17th century style bridge and nut pins. Dominic, thank you this is an interesting page and may help in my choice of wire. I know which one of these three is more pleasing to me, I am wondering: What are others’ thoughts on these?